Sin separates man from God. Can a born again Christian, a son or daughter of God, be separated from God by sin? Jesus said he would never leave us or forsake us. Hebrews 13:5. God will never turn his back on us, but we can turn our back on him. When we sin, we are forgiven. Jesus already has paid the price for that sin on the cross. We should not feel ashamed, or dirty, or worthless, because we are not yet perfect. It is Satan that makes us feel that way, not God. 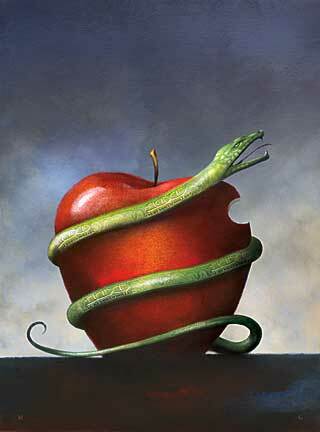 After Adam and Eve ate of the forbidden fruit, the first thing they did was hide themselves from the presence of God. If we sin, and do not understand that we have already been forgiven, we will also want to hide from God’s holiness. Satan is called the accuser of the brethren. He loves to try and separate us from our Father, and from the Lord Jesus. Revelations 12: 9And the great dragon was cast out, that old serpent, called the Devil, and Satan, which deceiveth the whole world: he was cast out into the earth, and his angels were cast out with him. 10And I heard a loud voice saying in heaven, Now is come salvation, and strength, and the kingdom of our God, and the power of his Christ: for the accuser of our brethren is cast down, which accused them before our God day and night. Satan was cast down, when he was defeated at the cross by Jesus sacrifice for us. We hand power over to him, when we let his voice separate us from the love of God. God does not want us to hide from him. Instead he wants us to thank him, that our sins are forgiven, and ask him to help us overcome that area of weakness in our lives. Hebrews 4: 16Let us therefore come boldly unto the throne of grace, that we may obtain mercy, and find grace to help in time of need. God tells us to come boldly to the throne of grace. Hallelujah! Thank you Jesus for making this possible. Romans 2:4Or despisest thou the riches of his goodness and forbearance and longsuffering; not knowing that the goodness of God leadeth thee to repentance? True repentance comes from coming to a full understanding of Jesus complete, full, and finished sacrifice, for all our sins. And for God’s perfect love for us. Psalm 103: 12As far as the east is from the west, so far hath he removed our transgressions from us. When we accept Jesus as our Lord and Savior, we never again have to be afraid of our Father, and hide ourselves from his presence. ← How does God correct us? As far as the east is from the west, so far hath he removed our transgressions from us. He paid the price for our sins on Calvary. I thank you very much, my friend for sharing this post on resurrection Sunday. God bless. Hi Noel, Everything truly does revolve around this wonderful event. Thank you for your comments. Thanks Terry, Happy Easter. God Bless. Truly beautifully explained. Thank you! Thank you for taking time to read and comment on my article. You are welcome.